Leicester born and bred, young entrepreneur and owner of The Bloom Project. 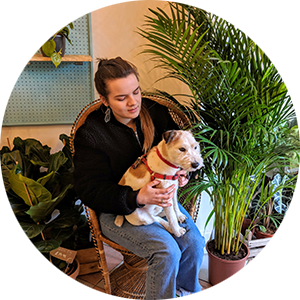 At the beginning of 2018 I was fortunate enough to receive funding for a studio based florist, however I always wanted a florist and plant store, but couldn't find the right spot. Within a week of receiving the funds 57a Queens Road popped up with a 'To Let' sign, fate huh? We renovated the shop, which was previously a beauty salon, in a matter of weeks and opened September 8th 2018. The shop is a colourful little jungle with a flower fridge taking centre stage, displaying unusual blooms. I consider myself a new age florist and my style is fun, wild and alternative. My dream was to provide cool blooms and plants and share my knowledge and passion with Leicester.